Please check me out every day this week on the Katie Show (ABC @3pm). I was selected to be one of three women discussing the challenges of finding my ideal job in this shaky, shut-downed economy and Katie Couric has set out to help me get this cool gig in a new segment called “Katie’s Classifieds.” Unbeknownst to me, I was referred for this series and the producers selected me the night before they started shooting. I don’t know about an overnight success story, but certainly my stint has been an overnight whirlwind. 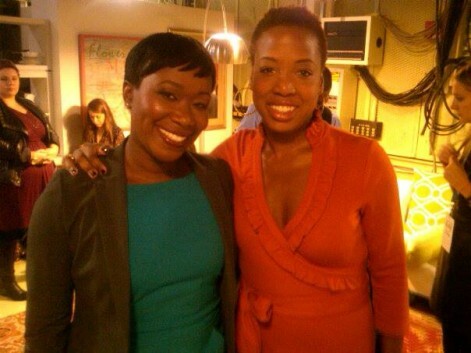 I thought it a propitious sign when on the first day of taping, I bumped into MSNBC contributor Joy Reid who was on an earlier segment talking about pop culture & current events. Of course this is crazy ironic because I would love to do exactly what she does for a living! It’s been fun getting my feet wet in the world of television, but it’s also been a bit stressful as I had to on Day-1 tell the producers to please let me tell my story and not frame me as this desperate, depressed unemployed Black woman. They attempted to edit some things I said into soundbytes that would’ve been great for ratings, but that I felt betrayed who I was. To be sure, I may be disappointed, even disillusioned at times in how long it has taken me to lock down a great gig, but I’ve never felt disempowered. Needless to say, they quickly, and with apology, revised my intro package. If this experience has reminded me of nothing, it has reminded me that as Black women, and no doubt, as women of color, we must always be self-defined, self-creating and determined in order to control (as best we can) our image and our story. Not only must we unapologetically tell our own story, but we have to be focused on framing it as well! Even in 2013, it’s heartbreakingly sad to admit, but there are not many sources that do not paint our pictures in juxtaposition to a white canvas. As bell hooks recently stated, we must do the work in creating our decolonized image. Truly, I have gained so much more than an opportunity at employment from this experience. I have found my voice more assured and steady than ever. 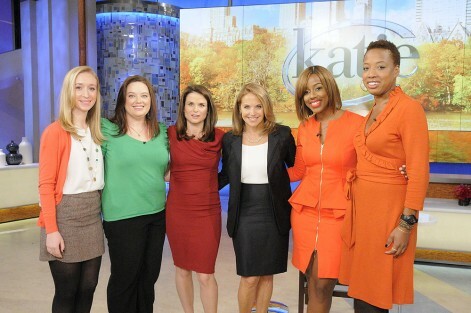 And for that, I’m so grateful to Katie Couric and her crew. What an inspiration! Seems like a divine appointment to me. Walk in it. Nothing ever just happens. A while back you wrote a post about disconnecting from the matrix of social media, and re-rooting. It was all preparation. You have women supporters rooting for you, who you don’t even know! Take flight, and be encouraged! This is inspirational! Good for you Nicole! Especially the last part, we must always be image activists like Angela michaela Davis and assert ourselves unapologetically. We must be in control of our output at all times to counteract the damage that has already been done. You are not desperate, you are speaking what you seek into existence. And more power to you for it. I really hate TV for the editing schemes, but I will definitely be checking for you this week! Hey Nicole! HUGE CONGRATS, AGAIN! I, as many others we know, have been through a similar transition. It is not only encouraging, but admirable to be able to share it with the world while “appropriately” representing us as black women/women of color. I especially appreciated your honesty and what you said about feeling disconnected at times due to your situation, but never feeling “unempowered” or “destitute”. Thank you all so very much! Your support fuels me to reach even higher and to stretch myself further.